Oasis Space is promoted as an application that will help you navigate the web. But in reality, its true purpose is to bombard your computer’s screen with third-party advertisements, so you ought to remove this program as soon as possible. Online advertisements are unreliable by their very definition. You may not realize this, but adware applications are apt to promote unreliable content that comes from largely unknown sources. This content may include malicious software installers and websites that use browser cookies to keep tabs on your browsing activities. Even Oasis Space itself has a built-in ability to collect some information about you. If you want to learn more about Oasis Space please read this short article. Unsurprisingly, this oddly named program is another release by SuperWeb LLC. This company is known for its software naming traditions of picking two random words and crafting to most bizarre names. This software developer has released numerous adware programs in the past. Some of the more recent releases include: High Stairs, Travel Output, Twinkle Star, and Happy Cloud. SuperWeb LLC is actually a subsidiary of Sambreel/Yontoo group, which is an online advertising company. This company distributes applications and browser extensions that render commercial advertisements inside the browser. Oasis Space is known to be distributed on not very legitimate shareware websites. Of course, its download is not hosted as a standalone application, because no one would install it when they realize it is a useless and even somewhat dangerous application. Therefore, it is distributed by bundling it with other applications. In most cases, SuperWeb’s adware is bundled with potentially unwanted applications that pose as PC optimizers, registry cleaners, and so on. 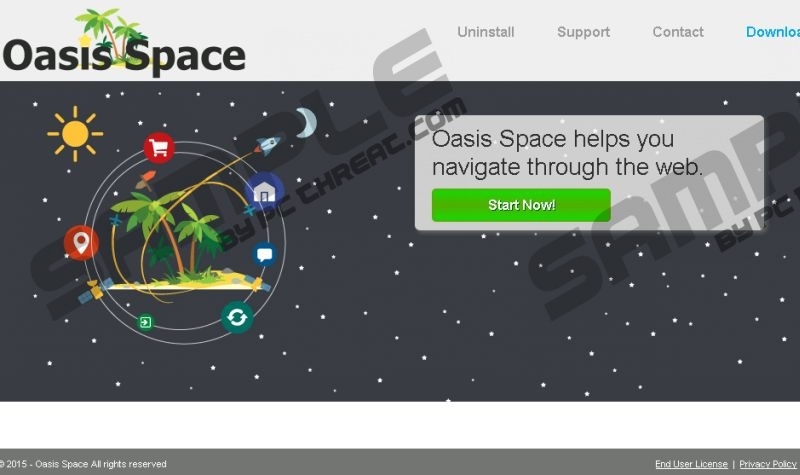 We believe that Oasis Space is also disseminated in this manner, since its website at Oasisspace.net only has a non-working download button. This program’s advertisements come in the most basic forms that include coupons, pop-ups, banners, interstitial ads, and a few other less used methods. First of all, its ads are annoying, because they can be displayed on most websites. We have seen cases were ads have been injected in Youtube.com and even in Google.com’s search results. Oasis Space is not very intrusive, but intrusive enough to hamper your browsing experience. On top of that the ads might subject your computer to unreliable and sometimes malicious software downloads. However, it mostly promotes potentially unwanted programs, such as registry cleaners, browsers, and media players. Note that its content is not limited to the aforementioned software. As previously mentioned, Oasis Space can and most likely will gather information about you. All adware applications do this, because that is how its developers can employ measures for targeted advertising. The information that Oasis Space can collect includes, but is not limited to, browser settings, approximate geographical location, language preferences, Internet Protocol (IP) address, browsing history, and search queries. This information will be collected and sent to the developers and possible to those who use this program to advertise their content. In addition, SuperWeb has the legal right to share and sell to third parties. Do you support such practices? If not then you might want to remove Oasis Space. Online advertising via ad-supported programs is undoubtedly a shady business. Oasis Space is not only useless, but can also display misleading advertisements that can compromise your computer’s security. So we suggest removing this application as soon as possible. Please refer to our instructions that will guide you through the whole process. Virtual security is as important as personal security, so you should not leave anything to chance. Right-click on the Windows Start and click Programs and Features. Find the adware and right-click on it. Find the undesirable program and right-click on it. Find the application and Uninstall it. Quick & tested solution for Oasis Space removal.